This is my 350th post in this blog. It's a long but very fruitful journey. I have learned so many things during this journey and I shared all my learning with you all thru this blog. 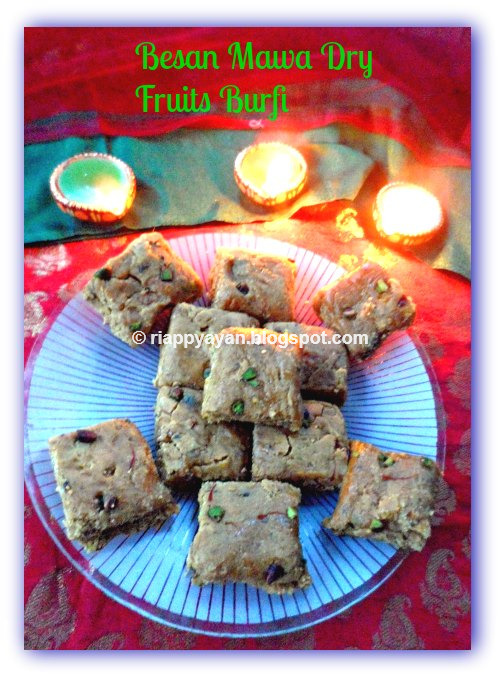 This asks for a celebration, so I made a sweet dish to celebrate this occasion, also Diwali is coming within a week. So, I prepared this sweet which is quite new to me and the recipe is from my fellow blogger, Priti of Indian Khana. 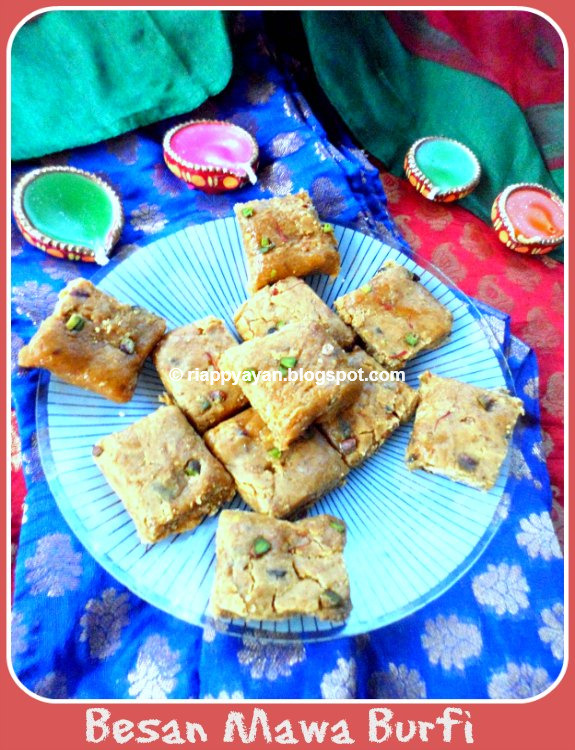 She has a treasure trove of all kinds of Festive sweet recipes from allover India. Diwali is festival of Lights and sweets. In every family, people make sweets and savouries by themselves and share these homemade goodies with family and friends. 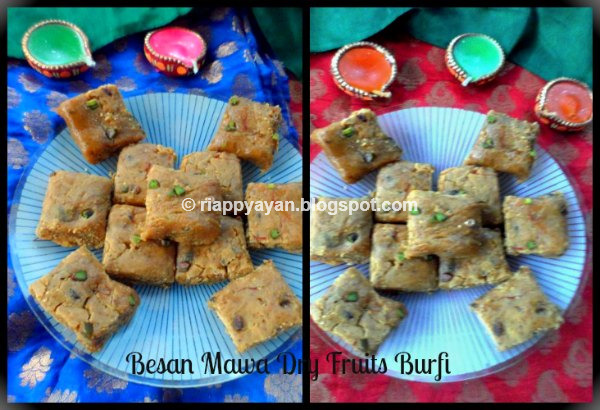 This Besan Mawa Burfi is one such sweet, which fits not only Diwali or any festival, but it fits any celebration, like birthdays and anniversaries. This takes quite a little time but the procedure is very simple, anyone can do it. I made this for first time but now I'll make these for every celebration in my family. 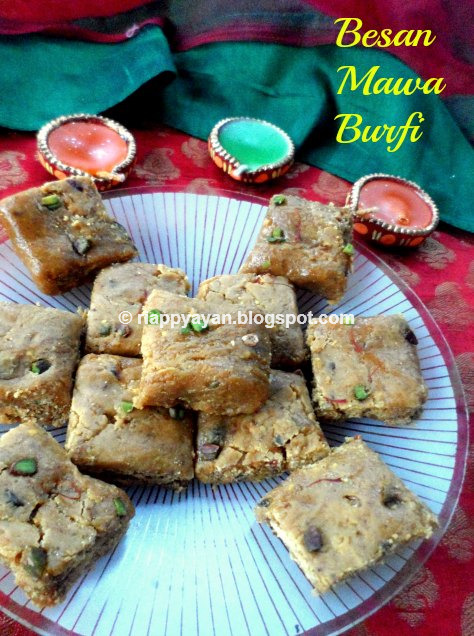 Mawa make these burfis extra soft and extra delicious. Cardamom Powder : 1 tblsp. Ghee/clarified butter : 2 tblsp. In a wok/pan, heat 2 tblsp. ghee, add chopped raisins and almonds or cashews, fry till they are golden brown, add besan or chickpea flour in the pan. Roast with continuous stirring in medium flame, till chickpea flour changes its color to light brown and roasted aroma of flour fills your kitchen. It takes about 7-10 minutes. Remove roasted besan to a bowl and let it cool. In the same pan, take mawa/khoya and in low flame, stir till it loosen up a bit, do not let the khoya to change its color. Add powdered sugar and 2-3 tblsp. milk and mix well. Add cardamom powder into the bowl of roasted besan/chickpea flour and mix well together and then add the mixture into the khoya. In medium flame, keep stirring this mixture till mixture becomes dry and leaves sides of the pan and feels not so sticky. Grease a plate with little ghee or oil, spread the mixture immediately and flatten it with teh back of a spatula. Decorate with pistachios and saffron stands. You can also use silver warq or anything of your choice. Let it cool completely before you cut it in squares or diamond shapes. As I noticed, this sweet dish taste better the next day, as with time besan dries up more and gives this sweet a better texture and taste. Do not put it in the refrigerator. Store it in air tight container and keep it for 3-4 days. Roasting besan is a very important step, so do it carefully, do not burn or keep it uncooked. Roast till you get an aroma of roasted besan and it changes to a light brown color. If you are using condensed milk, then lower the amount of sugar mentioned here and adjust according to your taste. 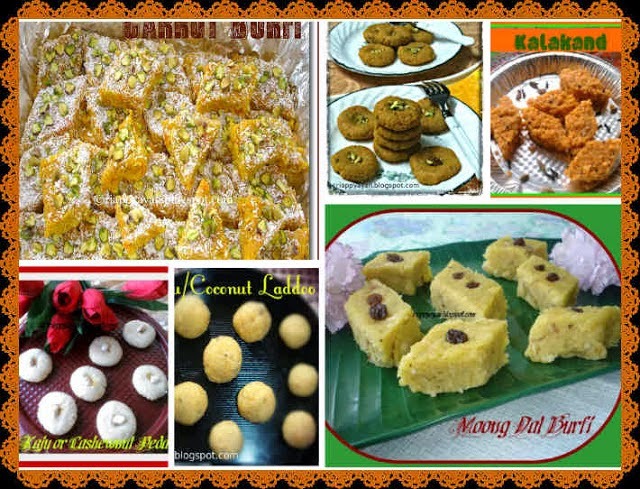 Here are some more Indian sweet recipes put together from my blog, which you can make during this festive season. Click this link.